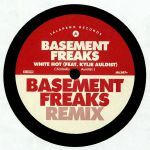 Review: Fizzing funkateers Basement Freaks can usually be relied upon to bring the dancefloor goods. That's certainly the case on this dancefloor-focused seven-inch. On the A-side they rework one of their own classic cuts, offering a punchier and heavier take on 2016 Kylie Auldist collaboration "White Hot". Rich in flash-friend funk guitars, crunchy breaks and life-affirming horns, their new revision is undoubtedly more DJ-friendly than the original album version. Turn to the flip to hear their tidy new take on Smoove collaborator John Turrell's 2013 cut "Won't Get Fooled Again", which they cannily refurbish as a wobble bass-propelled chunk of P-funk flavoured dancefloor soul.